…as distinctive as the new spindle grille is, Fukuichi is not overly attached to it. “Maybe we should change the shape in the future,” he says. This makes for a surprising insight — using the spindle grille on all Lexus models was not just a design decision, but indicates a huge shift in the way all design decisions are made. Lexus is prepared to continually reinvent itself. He pulls up a slide on his iPad to illustrate: it shows a white circle and a red square. They represent opposing ideas seemingly in conflict. The Western way, he says, would be to favor one over the other and end up compromising on both. He points to a diagram of a gray square with rounded edges to represent the compromise. 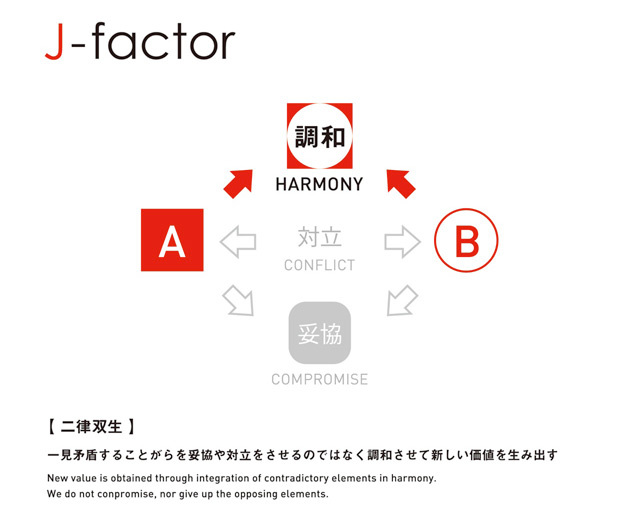 Another diagram meant to represent J-Factor shows the circle inside the square—both ideas together. This is a great way to demonstrate the design philosophy of Lexus, two conflicting elements coming together to form a balanced whole — what a brilliant illustration.